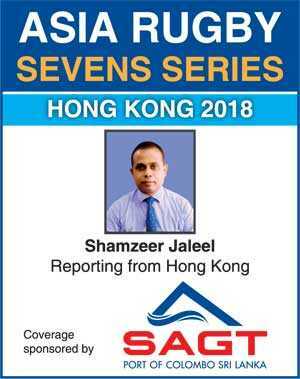 Experienced Navy Sports Club player Sandika Hemakumari will lead Sri Lanka’s women’s Sevens outfit while experienced Isipathana and Kandy SC player Srinarth Sooriyabandara will take charge of the men’s team for the Hong Kong leg of the Asian Sevens Series which will take place at the Hong Kong Football Club (HKFC) on 14 and 15 September. The touring squads left the island last night. Hemakumari, who made her debut with the national team 10 years ago, will take over the leadership role from her teammate Randika Kumudumali. Hemakumari played for Sabaragamuwa Province before moving on to represent Army and then shifting to Navy. The gutsy Sri Lankan women’s unit will meet Kazakhstan and Singapore on day one of the competition followed by an encounter against the Chinese on the second day. Meanwhile, the men’s outfit will feel the pressure without one of the country’s most experienced and feared Sri Lankan Sevens players, Dhanushka Ranjan, along with skipper Sudharshana Muthuthanthri. Ranjan is back at training and will be fully fit for the second leg in South Korea later this month. Jason Dissanayake and Tharinda Ratwatte will also miss this tour due to other commitments. This will give Sevens sensation Sooriyabandara the chance to lead the outfit. Gayan Weeraratne, Kavindu Perera and Danushka Dyan will be the three most experienced players in the touring squad. Kevin Dixon, who played under Naveen Heenakankanmge at the Under-20 Asian Sevens in Hong Kong, will return to the squad. He was in New Zealand training and has also changed his club to the team from Longdon Place. Heenakankanmge, Dinuk Amarasinghe and Adeesha Weeratunge will all board the flight to Hong Kong. The first leg will be played in Hong Kong on 14 and 15 September, the second leg will be worked off in South Korea on 29 and 30 September and the third and final leg will be contested in Colombo on 13 and 14 October. Men’s squad: Srinath Sooriyabandara (Capt. ), Gayan Weeraratne, Danushka Dyan, Kavindu Perera, Sudam Sooriarachchi, Rehan Silva, Reza Raffaideen, Kevin Dixon. Adeesha Weeratunga, Buddima Piyarathne, Naveen Henakankanamage and Dinuk Amerasinghe. Head Coach - Peter Woods.